Kenora, ON — Ogichidaa Francis Kavanaugh, Grand Chief of Grand Council Treaty #3 called Bill C-92’s Indigenous child welfare act completely unacceptable adding the proposed legislation is paramount to political interference and continues the historical oppression of Indigenous Peoples. 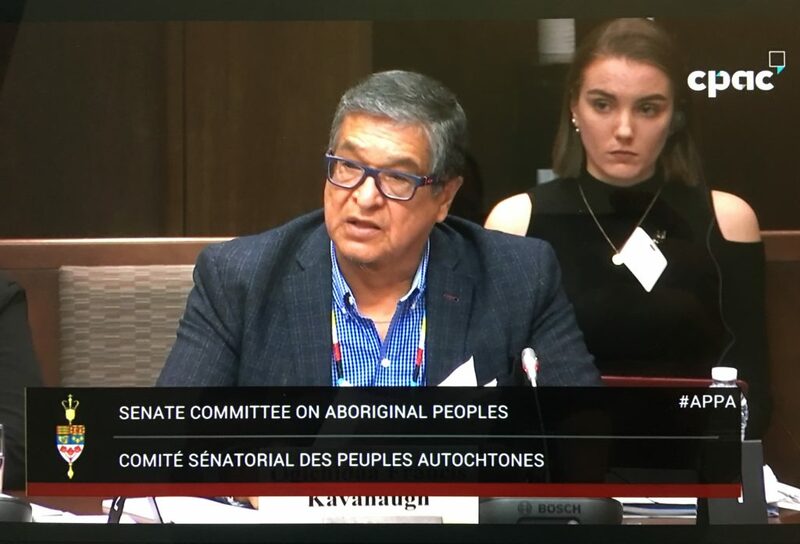 Addressing the Senate Standing Committee today in Ottawa, Ogichidaa Francis Kavanaugh implored they consider Bill C-92, an Act respecting First Nations, Inuit and Métis children as an imposition of unilateral legislation by the federal government. While just 7.7 per cent of all Canadian children under 14 are Indigenous, they account for 52.2 per cent of all children in foster care. “In Treaty #3 there are codified laws including Manitou Aki Inakonigewin (translated to English as the Great Earth Law) and Abinoojii Inakonigewin (our child care law). The process for codifying our traditional laws into written laws must abide by our traditional protocols. Our traditional protocols include ceremony and spiritual sanction, national meetings for guidance with our elders, women, men and youth and the work of our leaders to oversee this comprehensive process. Through this, we have united to endorse our traditional law: Abinoojii Inakonigewin, that was ratified on October 6, 2005, however; its origin ascends prior to contact. Our communities and our childcare agencies in Treaty #3 have adopted our law –Abinoojii Inakonigewin and practice our traditional law. In collaboration with our childcare agencies, while respecting the unique needs of every community and the autonomy of our individual leaders, our law has been implemented at the community level through the development and implementation of distinct community codes. Our childcare agencies are vital to the actualization of Abinoojii Inakonigewin and are supportive to the implementation plan. We have three childcare agencies, Anishinaabe Abinoojii Family Services, Weechi-it-te-win Family Services and Sagkeeng Child and Family Services in Manitoba that have been providing a bi-cultural service delivery model dating back to the 1980’s. These Agencies have had great success with service delivery such that they have been called upon to mentor and assist in the development and creation of other Indigenous led service delivery across Canada. As part of successful adoption of Abinoojii Inakonigewin, the cooperation of both the Provinces of Ontario and Manitoba have been instrumental in Treaty #3 providing support, and resourcing the work that has been undertaken. There is a Bilateral Table with Ontario with a signed Relationship Agreement and discussions have been initiated with Manitoba and the Southern Chiefs Organization to ensure proper political protocols are followed. The bill directly undermines the respectful work that we have undertaken with the Provinces for the past decade. The Federal government has not assisted us with the development and implementation of Abinoojii Inakonigewin nor have followed the proper political protocols. This is a fundamental issue that we have had since the successful implementation of our childcare law and now the federal government is proposing the imposition of unilateral legislation, which will bind and restrict our traditional law. This is completely unacceptable. Instead of being a partner at the table, the federal government has put forth legislation that will fundamentally limit our laws, institutions and practices. Grand Council Treaty # 3 puts forth the position that this proposed legislation is a pan-aboriginal approach that does not consider the unique jurisdiction and recognize the governance/law-making capacity of Grand Council Treaty No. 3. This proposed legislation is paramount to political interference of the Federal government and we take this matter very seriously. Our children are sacred gifts from the Creator and we have undertaken solemn commitments to the responsibility of our child care. This bill is a direct extension to continued, historical oppression by the Federal government on our people and intervention is necessary. I implore the Senate to consider the ramifications that this legislation imposes on Treaty #3 and other Indigenous Nations across Canada. For our territory the irrevocable consequences come at a cost that we simply cannot afford: political degradation by the Federal government at the expense of the wellbeing of our children and our families. Grand Council Treaty #3’s overall goal is the protection, preservation and enhancement of Inherent and Treaty Rights. Grand Council Treaty #3 is 55,000 sq. miles spanning from west of Thunder Bay to north of Sioux Lookout, along the international border, to the province of Manitoba. It is made up of 28 First Nation communities, with a total population of approximately 25,000.